This website offers you pre-made campaign maps, packages of artwork referred to as art kits, that target users of roleplaying games, virtual tabletop gamers and game developers that seek artwork for their game projects, be it physical or digital game projects. The art kits and art contents are digitally drawn and saved as .png files with transparency, making it ideal to make battle maps, game levels and use the huge number of characters, animals, creatures, monsters, items, objects, vegetation and more on top of the maps. Everything typically comes with shadows built into the artwork. The artwork is in many cases provided in sets of 2 or 3 image sizes. These sets are named Quartersize, Halfsize and Fullsize. Take a character token as an example: Quartersize would in most cases be an image of 128 x 128 pixels, Halfsize would be an image of 256 x 256 pixels, and Fullsize would be an image of 512 x 512 pixels. Some monster tiles or ship tiles are larger than 1024 x 1024 pixels also. Just to give you an idea of what the provided sizes are. You may of course scale each of the sizes to anything you desire. PLEASE KEEP IN MIND: The Roguelike art kit series are typically of the Quartersize scale or even smaller, these will work well with Roguelike or other digital game projects but are unsuitable for printing purposes due to their small nature. Private users are people who seek to purchase the art kits and use the artwork for their own roleplaying game sessions, and/or with a limited number people within their roleplaying games groups, online or offline. Private users are not allowed to make the art kits available to anyone else, offline or online, products such as games or battle maps may not be distributed or made available to anyone else except for the purpose of using the art and products with the limited number of people within the roleplaying group, offline or online. PRivate users have the option to “upgrade” to a commercial license, paying only the amount between the base fantasy art kit and the Developer license fee. Please contact me if this applies to yourself. Commercial users are individuals or smaller indie game companies looking to use the artwork and art kits to create products such as games and battle maps, are looking to use the artwork for illustrative purposes and distribute the end product for free, shareware or for sale. To be able to make available / distribute products created with the artwork found in these art kits with a commercial purpose, you are required to own a Developer license, which is available for purchase through this website. The Developer license is a one time fee, after this, no royalties or percentages of your income are to be paid towards the creator of the art kits. The Developer license is personal and can’t be transferred to anyone else, it does not grant you a re-selling license, re-selling in this case refers to purchasing art kits and reselling the art kits as they come, or dividing the art kits in several pieces and reselling them, without using them to create a product. Using the art kits and it’s contents to create new derivative art kits is also prohibited. A reseller is someone looking to add the art kits to their online marketplace, such as a virtual tabletop marketplace, reselling the art kit contents as they are without creating a new product with them. Please do contact me if this is something you are looking to do. Through an idea conceived during the late summer of 2012, the project was created and successfully funded via kickstarter.com. 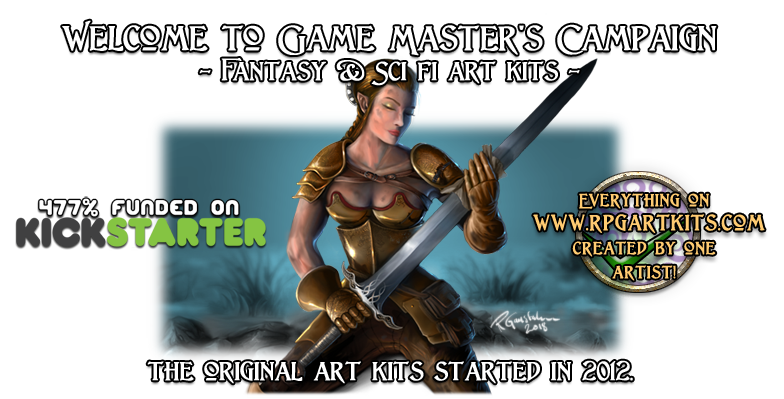 The Game Master’s Campaign – Fantasy art kits was the first selection of themed art kits to be developed and created, for use with digital and physical rpg game projects, mainly targeted at roleplaying games DMs or GMs, who are looking for artwork for their roleplaying game campaigns. Owners of the art kits may create campaign maps, add tokens on top of them and battle it out, using the massive library of backgrounds, tiles, tokens, spell effects and more found in the various art kits. The art kits contain artwork only, a tile mapping tool and/or a paint software that can handle .png files and work with more than 1 layer is preferred, such as Photoshop. This allows you to customize the maps and add even more details to your maps. If you are looking to create physical or digital products using the art kit contents, a Developer license is required. If you are a VTT developer or a company that sell roleplaying games assets and are looking to resell the art kits, please contact Raymond E. Gaustadnes. Please use the top menu to navigate this site. Each product/art kit contains detailed descriptions and previews of their contents. Please keep in mind, due to the nature of these art kits being digital products and easily copied, refunds cannot be given to any or all purchases. Products are sold “as is” and come as described. The Developer license grants you the rights to use the artwork with your commercial projects.